Saydisc delves into its back catalogue with this compilation of – as it puts it - humorous anecdotes, poems, songs, dialect and tall tales. The dialect items relate almost wholly to Gloucestershire and reveal linguistic survivals from the pre-war years, heard in speech or interview that – whilst not always meaning to be humorous - do throw up humour in their wake. The extraordinary Amy Cook of Coombe, Wotton-under-Edge befuddles even her interlocutor in 1965, Peter Duddridge, who struggles – as will you – with her pronunciation of ‘papers’. She was a road sweeper, amongst other things, and embarks on one of those folk songs that sound as if they’ll go on to the end of recorded time, and probably could. Fortunately, though, even this indefatigable woman stops. One constituent of the interviewees is, inevitably, an anti-modernism that manifests itself in an almost Luddite distrust and dislike of ‘the electricity’. The extent to which rural isolation had inured them to the metropolitan blandishments of Edison’s light bulb is remarkable, to the extent that to say ‘I don’t believe in electric’ (as do George and Dorcas Juggins of Chalford, Stroud) is no more than a statement of eternal values. Geoffrey Woodruff’s witty exploration of ‘Bristolese’ is particularly deft as is his long 10-minute track just called Geoffrey Woodruff Entertains, which brings appreciative laughter from his audience. 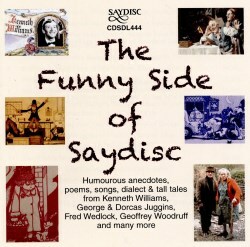 There are two well-known Music Hall items included, by mighty Harry Champion and Jack Charman and they remind one of the great work Saydisc continues to do promoting Britain’s recorded heritage on disc. The readings from Kilvert’s Diary and Kenneth Williams’ Lewis Carroll and Edward Lear excerpts also show the range of the label’s aspirations. Some rare items are here, including a slightly scratchy copy of The Crofters’ The Butter Churning Race, composed by Saydisc supremo Gef Lucena, which is full of wry humour. This is a nice sampler of Saydisc’s wares and with a warm-hearted booklet I hope it encourages readers to explore the catalogue of this entertaining and valuable label.